East Vail is a neighborhood unto itself and the first to encounter after descending Vail Pass. Follow Bighorn Road one mile east and turn right at the 2nd, Streamside Circle. Immediately turn left around the stone planter onto Meadow Drive and continue to head east. Follow Meadow Drive about ¼ mile to the Vail Racquet Club Mountain Resort which will be on the left. Located just 35 minutes West of Vail Racquet Club, Vail/Eagle Airport provides the most convenient access to the Vail Valley. American, Delta and United offer daily non-stop flights from major markets including: Atlanta, Chicago, Dallas, Houston, Los Angeles, Miami, Newark, New York (Kennedy), Phoenix, Washington DC. Fly direct to Vail on your next trip and start your vacation that much sooner! Visit www.flyvail.com for current schedules and more information. Be sure to check rates from our concierge page. This link offers discounted rates with our transportation partner: Colorado Mountain Express for worry free round trip transportation to and from either the Vail/Eagle Airport or DIA. Don’t have a car in Vail? No problem! Vail has the largest free bus system in the U.S. and has pedestrian-friendly streets. The front desk will supply you with this information at check in. 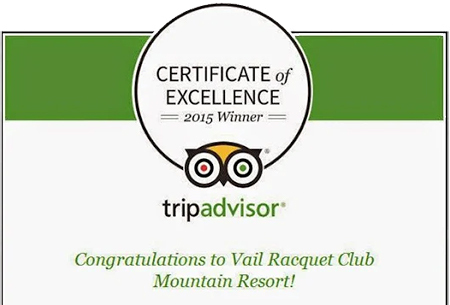 Additionally parking at the Vail Racquet Club Mountain Resort is free for all resort guests. Click here to view the Vail Racquet Club property map. Please note: requests for unit locations cannot be taken during the reservation process.